The following was done on Ubuntu 12.04 but should be similar on other recent Linux distributions. To do proper colour calibration of your monitor you need a colorimeter and some software. The software to use is Argll CMS , this is a command line tool but there are GUI addons provided by other authors. You need a colorimeter compatible with Argll – check here for details of what hardware is supported by Argll. I chose the Pantone Huey as it was readily available and was the cheapest ( note don’t buy the Pro version – it is the same hardware – you just get better Windows software which we won’t be using anyway ). Use you favourite tool to install Argyll from the Ubuntu repositories. 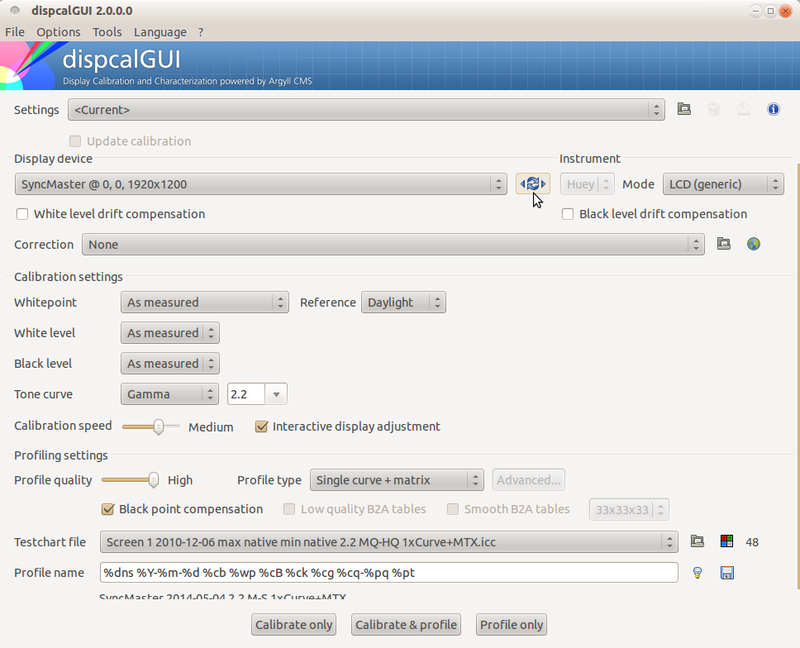 If you are using Gnome then also install the Gnome CMS colour management system. To make the Huey accessible by a non-root user you need to add some rules to Udev – fortunately Argyll comes with a set of rules that can be copied into place. Download the package for your distribution from the DispcalGUI site and install it – Ubuntu will fireup the install tool when you click on the Ubuntu package. Make sure your Huey is plugged into a USB port. Startup Dispcal from your applications menu. It should automagically detect your display. click the symbol between the display device and instrument – it should then show the Huey and the Calibrate and Profile buttons at the bottom of the screen will activate. Click on Measure for the Whitepoint and put the Huey face up next to the display. This will also measure the ambient light. You should really read the DispcalGUI manual which explains all of the settings that you should change from the defaults. A grey patch will apear on the screen and a terminal window will also open with instructions. Place the huey on the screen over the patch and select check all from the menu in the terminal window. Follow the instructions given. After calibration you are asked to install the profile created and make it the default one. If you have installed Gnome CMS it will handle the installation and activation of the profile.